High Torque Intake Ports, Up to +90hp! Finally, the most user-friendly big block head series on the market has been developed. 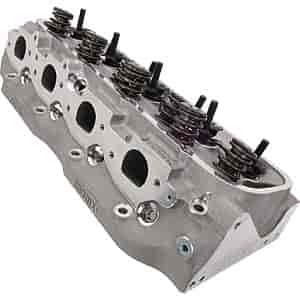 The Brodix Big Block Chevy Race Rite 26-degree cylinder head bolts directly in place of stock cast iron heads without you having to shop for a new intake manifold and pistons. The most important improvement is that the exhaust ports are in the stock location eliminating header or manifold interference. The Race-Rite oval and rectangle port heads are filled with years of Brodix racing technology. They help build horsepower for the budget minded racer looking to take a step up without big hit to the wallet. Race Rite is the answer for more horsepower, a hassle-free installation, and a great-looking engine compartment! As always, these heads come standard with all the fine qualities that only Brodix has to offer. Every casting is poured from A-356 virgin aluminum and tested before Brodix utilizes their in-house processes such as finish machining and heat treating to assure that you receive the best products for your hard-earned money. The industry standard has been taken to the next level with modernized CNC porting. Other features include a thick deck surface that is compatible with nitrous, drilled and tapped holes on the ends for standard drive accessories, phosphorous bronze valve guides and hardened valve seats installed for unleaded fuel. Sold Individually, 1/pkg. Spring Pressure Open: 365 lbs. Spring Pressure Closed: 150 lbs. Spring Pressure Closed: 250 lbs. *NOTE: Horsepower gains compared to factory cast iron cylinder heads.